The Glock® 43 Semi-Auto Pistol utilizes a single-stacked magazine in 9mm to make it slim and compact, specifically for concealed carry use. Made with the same materials and quality control as all Glock semi-automatic pistols, the G43® is a carry gun with the power of a 9mm field gun that you can count on for survival. Internally, the Glock 43 employs the same striker fired, short-recoil operated, and locked-breech barrel as the larger framed Glock pistols. The Safe-Action trigger system makes shooting in stressed situations infallible. The rough textured polymer grip frame provides a solid hold, and while the G43 is quite concealable, the grip offers shooters enough surface area for optimal fire control. The frame and slide are black polymer. The white-dot front sight and the white-bracket rear sight provide rapid acquisition in dim lighting situations. This model includes a Crimson Trace Laserguard. The length, shape, finger rest, and size of the trigger opening are the same as the larger pistols, and the trigger is the same size, making them all familiar to those who already use Glock pistols. The Glock 43 Semi-Auto Pistol is a reliable, easy to maintain firearm that's perfect for everyday carry. 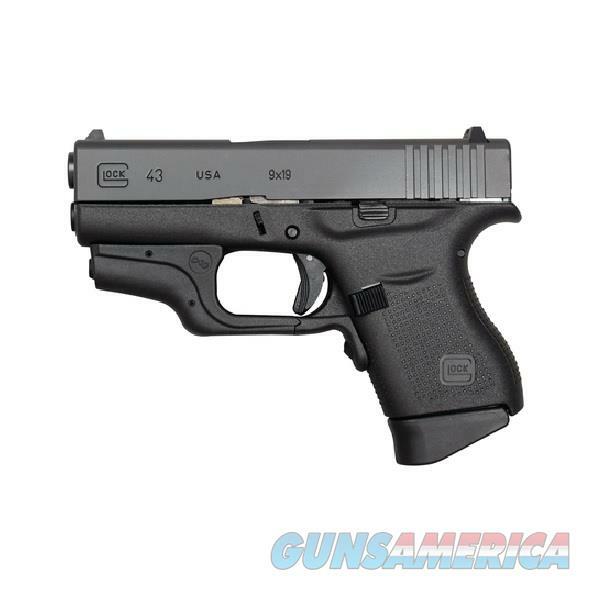 The G43 comes with 2 ultra-reliable single-stack 6-round magazines. Includes Desantis Nemesis Pocket Holster.